This Agreement is governed by and construed under the law in the State of Queensland. Any legal action in relation to our products or services may be brought in any court of competent jurisdiction in the State of Queensland. TREK 4×4 warrants Avenger Top canopies purchased from TREK 4×4 for a period of 12 months from date of delivery to the original purchaser. Warranty is not transferable from the original purchaser and cannot be claimed by third parties. All warranty work MUST be carried out by TREK 4×4 or a representative assigned by TREK 4×4 at their premises. We do not guarantee 100 % against water leaks due to the way pickup truck beds are made and do not warrant using an over lip ute liner. Warranty does not cover the paintwork to the vehicle only canopy and or Ute accessory. Any transportation costs involving any warranty work will be responsible of the owner/customer. TREK 4×4 does not cover natural wear and tear or damage to any part of the vehicle where an addition or attachment of an aftermarket product is made to or fitted to. Labor costs to any TREK 4×4 products is not covered. Any alterations or work carried out to TREK 4×4 product without the consent of TREK 4×4 shall void this warranty. If a water leak occurs all diagnoses and rectification work must be carried out at our factory. Transport damage is NOT covered by TREK 4×4 under any circumstances. No Transport Insurance is provided unless expressly detailed / advised on your invoice. Loss of income, use or enjoyment while undergoing warranty work is NOT covered by TREK 4×4. Any damage as result of exceeding the carrying capacity, misuse or negligence by the customer will not be covered under warranty. Any warranty claims made must be supported by an original tax invoice, without the tax invoice your claim cannot start to be processed ( this is to assess that you are the original purchaser & the date of purchase ). If and before any warranty claim is made materials needed to support a claim are: original tax invoice, canopy serial numbers, digital images of any defects. If required a minimum of 2 repair quotes within 30 days of warranty initiation or warranty will become void. All claims need to be in writing. The repair or replacement of the product remains solely at the discretion by our company. This warranty does not extend to inconsequential or incidental damage including but not limited to damage to customer’s vehicle, goods, cargo or any other party or property. TREK 4×4 may choose to repair any TREK 4×4 component or product rather than replace it. All nuts and bolts, fixtures and fittings must be checked at monthly intervals and tightened if necessary as per fitting instructions provided with the accessory. 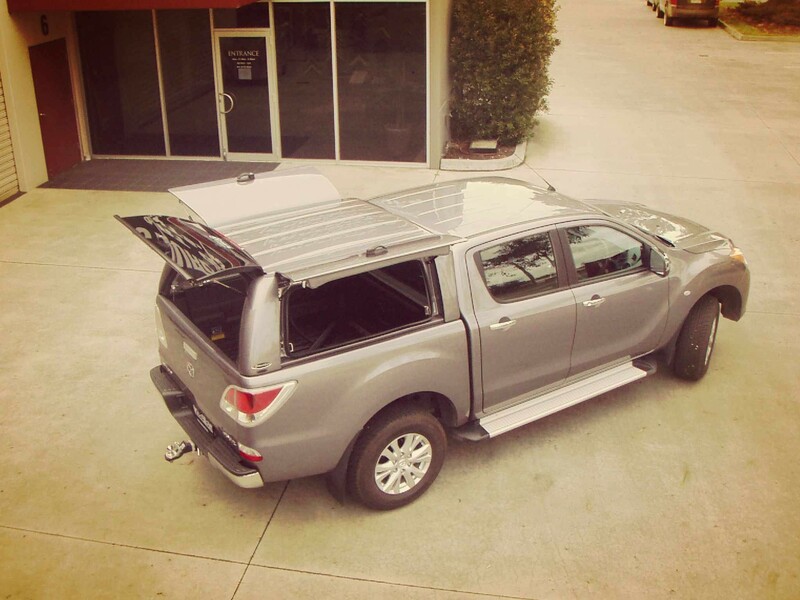 Ute Canopy – driving with doors or windows in open position is not recommended. Unless otherwise stated, our products are warranted to be free of material defects and workmanship while in the legal possession of the original owner. Any items considered to be defective should be returned to TREK 4×4 for inspection at the purchases expense. All products finishes, including polishing; powder coating; etc are not subject to this warranty. Exclusion from warranty; our company does not warrant that the products sold by the company comply with the laws of the country in which they are purchased or used. It is the sole responsibility of the Purchaser to ascertain whether products comply with local laws. We shall not be liable for any other claim including claims arising from incorrect fitment, product modification, and fault design, the use of the product and any indirect special or consequential damage or injury to any person, company or entity. The warranty is excluded if any product sold by us is modified in appearance (including custom fitting in any way) or operation without express written consent by us. Warning: Some Vehicles are equipped with Airbags. The installation of our products could alter the vehicles crumple zone and operational characteristics of the airbag. Rights reserved: Due to the continuous changes and modifications, the information, products, specifications and the range contained in our sales is subject to change without notification. where TREK 4×4 is required to send the goods to you, upon delivery of the goods to your carrier. Ownership and risk to the goods passes to you upon delivery. The delivery times made known to the Buyer are estimates only and TREK 4×4 is not liable for late delivery or installation. TREK 4×4 will not be liable for any loss, damage or delay occasioned to you arising from late delivery or late installation of the Goods. Where TREK 4×4 is required to send the goods to you, you authorise TREK 4×4 to engage Toll Logistics ( or other Freight Carrier ) to act as your carrier on its standard terms and conditions. TREK 4×4 is not responsible to you for any loss or damage to goods in transit caused by any event of any kind or by any person (whether or not the TREK 4×4 is legally responsible for the actions of that person). 2.serve a claim for compensation on the carrier within 3 days of the date of receipt of the goods. Suggested method of claim ‘damaged in transit’ 1.Pictures of the boxed item and damage 2.Unbox the item with a member of the Freight staff present 3. Take pictures of the damaged points, also take note of the Freight staff contact details. 4. Engage the Claims Department of the Logistics Carrier. Note: if the item is taken away offsite from the freight carrier it is very difficult to lodge a claim, as it is unclear as to where the freight damage occurred. For the removal of any doubt, TREK 4×4 will not be liable for any loss or damage caused to, or by the goods, during installation by you or any third parties following delivery, including installation by you or a third party at TREK 4×4’s place of business. When an item is ordered at the specific request of a customer for example a colour that is not in general stock, an older make and model that is not generally stocked or our Workstyle Canopy which is always ordered by request and if the item is not collected within 10 days of its arrival the deposit associated with the purchase is forfieted to compensate Trek4x4 for the purchase of an item that is not part of its general stock allocation. Any alterations to the original product will void the standard warranty. Our canopies and ute drawer systems are produced in a World Standard ISO 9001;2008 TUV CERTIFIED FACTORY. As such all efforts are made to ensure the product is produced at a very high standard. Works completed outside of this plant for instance customising roof bars or paintwork that has not originated from the factory in its original form compromises the product. The additional works that are completed as a customisation are done outside our factory and therefor outside our control. As such this voids the warranty. The following items need to be attended to on a regular basis. More frequent service in severe off-road conditions. Ensure mounting bolts always remain tight. Check regularly that screws holding down windows and doors are tight. First 1000Km the mounting brackets are required to be checked and tightened. Then Checked every 5000km. Lubricate lock and key recess on rear and side doors. Abrasive compounds are not recommended for polishing surfaces of painted products. Clean door rubbers on canopy tailgate assembly and lightly coat with silicone spray. Ute Lid locking mechanism should be lubricated regularly. Drain holes need to be checked and any debris collected. Abnormal or extreme off-road usage. Removal or defacing of the product serial number. Lack of regular servicing as stated on the maintenance list. Using a Ute Liner in some utility vehicles can cause paintwork scuffing. Driving with a window, tradesman or rear door in an open position. Gel coat cracking, is a characteristic of fibreglass and does not constitute a structural defect, therefore is not warrantable. Modification to the product or its components. Paint scuffing to vehicle caused by a canopy is not warrantable. Older cars – the age of the car being exposed to weather conditions can dull and in some cases change the paint colour and finish of the vehicle. Once an invoice is raised either to hold an item that is in stock or if an item is ordered as the expressed request of the client – Trek4x4 will contact the client – a minimum 2 phone call and or e mails requesting the outstanding balance payment. If the payment has not been made, the item will be considered as abandoned and we reserve the right to sell the item. The deposit amount will be forfeited to TREK4x4. We encourage clients to contact us with regards to balance payments.